This little narrative is placed at the very beginning of the Alphabetical Collection of the Sayings of the Desert Fathers. The collection was compiled in its present form in the late sixth century, but it contains sayings dating back to the early fourth century. The Father of all monks, St. Antony the Great (c. 251‒356) is depicted here as receiving a divine inspiration about the value of work in the life of a monk. He is shown that, far from being an obstacle, or distraction, work must be regarded as an essential element in the quest for prayer without ceasing. Unlike the Angels, we human beings are not capable of maintaining an uninterrupted and undistracted focus of attention on the Lord. We need some alternating rhythm in our day. We need to use our bodies. We need to have something to do. Some simple manual work, ideally of the sort that occupies the hands but leaves the mind free, has a place in monastic life no less important than Psalmody or silence or fasting. Through it, and not in spite of it, the monk will live in accordance with God’s will. He will deepen his ceaseless recollection and interior peace. He will grow in humility, in purity of heart and in holiness. The story about St. Antony and the Angel makes one small contribution to an extensive polemical literature from the early centuries of monasticism. Orthodox monks of both East and West felt the need to counter a doctrine, or a temptation, that would hold work in disdain. Among those associated with this idea was a sect labelled the Messalians, or Euchites. Its adherents held that work must be somehow unworthy of a perfect Christian, and especially of a perfect monk. The real ascetic, having become wholly spiritual, will have no time to waste on merely mundane pursuits. Being entirely taken up with prayer, and obedient to the Gospel command never to be anxious about food or drink or clothes (cf. Mt 6:25), such a one will enjoy uninterrupted gnosis of the Holy Trinity. St. Basil the Great (c. 329‒379) was one of those who felt obliged to add his voice to this controversy. In his Longer Rules Number 37, he gives a full response to the question: “Is it necessary to work?” And: “Should we neglect work on a pretext of prayers and psalmody?” Basil begins his answer with the Dominical text: “The labourer is worthy of his food” (Mt 10:10). In his typical fashion, he then turns immediately outwards. We need to work, he says, in order to have the means to give to the poor. In support of this, Basil quotes more than once the text from Ephesians 4:28: “Let him labour at some honest work with his hands, so that he might have something to share with those in need.” The life of piety, Basil goes on to teach, cannot be an excuse for idleness. On the contrary, it has to be a relentless combat, a hard ascesis, a training for patience and tribulation. And this is good for us. Our body needs the physical exercise, and our soul needs the opportunity to grow in charity and concern for those in need. Whereas, by contrast, idleness is bad for us in every way. Basil deploys here a battery of scriptural texts in favour of this point, of which the strong words of St. Paul form the centre piece: “Whoever does not work, let him not eat” (2 Thessalonians 3:10). As for the necessary alternation of work and prayer, Basil would agree with the Fathers of the Egyptian desert. Our work must be thought of as one ingredient in our life of prayer and union with God. Ideally, and if possible, prayer should continue even as we work. And if while we work we find ourselves unable actually to praise God with our tongues, then we should continue to do so at least in our hearts. Drawing upon a very rich tradition of monastic literature, explicitly including the writings of St. Basil, and of the Egyptian desert Fathers, some time in sixth-century Italy St. Benedict wrote his Rule. The forty eighth chapter of the Rule is devoted to “The daily manual labour.” At least, that is the title of the chapter. Its real subject, though, is rather the desired balance in any monastic or Christian life between prayer and work: work that is truly a part and expression of our prayer; prayer that must be the chief work of the monk. We find in St. Benedict’s Rule something of a tension between toil and rest. This tension is actually fundamental to the whole monastic life, and to the whole Christian life. Benedict speaks often in terms of urgency, even haste; certainly energy, purpose, determination in pursuing our heavenly goal. To his way of thinking, we don’t have much time in this life, and we need to make full use of the little we have been given. Yet, on the other hand, we need to be at rest in God’s presence. We need to have space and time to listen to his still, small voice. We need to be perfectly clear that we prefer nothing whatever to Christ. As later medieval writers would express it, the monastic life could even be defined as sanctum otium—a “holy leisure”; the life symbolised by Mary rather than her sister Martha (cf. Luke 10:41); an environment which provides for that freedom from the pressing business of this world, and from distraction, and from a divided heart, which St. Paul recommends for the unmarried (cf. 1 Corinthians 7:35, 34). So, in his Chapter on manual work, St. Benedict uses the Latin word vacare six times: to be empty, free, open, available. At set times in each day the brothers are to work; then at set times they are to be free—or in Latin, vacent—for their holy reading. That is, in addition to the hours spent praising God in Choir, Benedictine monks are to spend several hours each day at their lectio divina. For the ancients, this exercise of reading and learning Holy Scripture is an encounter with God in his holy Word. Around a thousand years before the time of St. Ignatius of Loyola, in monastic usage the word meditatio refers above all to this manner of reading. So, we should think of Benedictine lectio divina as explicitly an exercise of prayer. To it the monk must give some of the best hours of his day. Here comes the tension. Lectio divina is demanding. It requires dedication, application, effort, perseverance, as does the prayer of Psalmody, which St. Benedict calls the Opus Dei—the Work of God. So, we find in Chapter 48 of the Holy Rule the word vacare also used in its negative sense. What if a brother is found so slothful, so negligent, so apathetic (acediosus, neglegens, desidiosus), that he wastes, or fritters away the time which should be spent in lectio divina? Let him be corrected, and if he fails to amend, punished. But if that fails to work, then at least let him be given some work to do, if necessary even on a Sunday: so that he may not be idle—ut non vacet (Holy Rule 48:23). What sort of work is suitable for monks? St. Basil sets out principles that he thinks should guide the choice of work. Work must not be allowed to interfere with the peaceful and untroubled nature of monastic life, nor must it involve too much contact with people of the outside world. Crafts he recommends are weaving, shoe making, building, carpentry, metalwork and agriculture (cf. Longer Rules 38). Basil doesn’t mention here the hospital he established by the monastery for the care of the local sick, nor his own preoccupation with pastoral, controversial and apologetic writing. Basil’s younger contemporary St. Jerome (c. 342‒420) offers his own suggestions about suitable monastic work, in his Letter 125 to Rusticus: horticulture, grafting of fruit trees, apiculture, basket making, fishing net manufacture, the copying of books. Jerome also fails to mention here his own massive work as a scriptural exegete and translator, and as a theologian and controversialist. Regarding agriculture: it did not find favour among all the monastic Fathers. In his twenty-fourth Conference, St. John Cassian (c. 360‒435) warns against excessive outdoor activity, because inevitably that will lead to the dissipation of a recollected mind. Too much farm work will also habituate monks to being outside their cells. 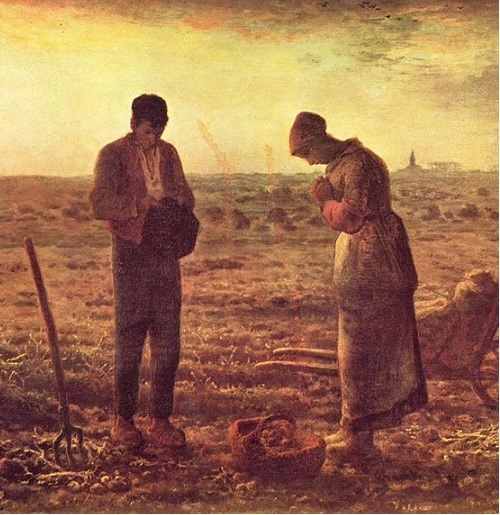 St. Benedict speaks of heavy manual work in the fields, but only as if that were an exception, forced on monks of a particular community because of their poverty. Nevertheless, he comments on that positively. If that is their case, he says, they should not be distressed: “because then they are truly monks, when they live by the labour of their hands” (Holy Rule 48:8). We can gain a useful insight into St. Benedict’s mind on the subject of work by comparing his approach with that of the Rule of the Master. Benedict leaned on this Rule while composing his own, but silently distanced himself from many of the attitudes and conclusions of its anonymous author. If the Messalians occupy one end of a spectrum of opinion on monastic work, then the Master stands opposite, at the other end. He wants his monastery to be set up like a work camp. Its inmates are there for penal servitude, and the Abbot’s business is to ensure that none of them gets away with a moment’s respite. In striking contrast to this, St. Benedict is continually looking out for the weaker brethren, making sure that they be not over-burdened, or saddened, “for no one should be disquieted or distressed in the house of God” (31:19). If they need help, they must have it. If the common fast is too hard for them, let it be broken (35:3, 12). As for types of work, St. Benedict prefers to stick to principles. “Let them work at whatever needs to be done” he says (48:3). Ideally, he wants his monastery to be so constructed “that within it all necessities, such as water, mill and garden are contained, and the various crafts practised. Then there will be no need for the monks to roam about outside, because that is not at all good for their souls” (66:6‒7). One activity that Benedict ring-fences is care of the sick “which must rank above everything else, so that in them Christ may be truly served” (36:1). Another very important task is that of providing hospitality. “Guests,” says Benedict, “are never lacking in a monastery” (53:16). They also must be served as Christ himself. This means that they must be treated “with all humanity,” that is, properly fed, comfortably housed, and duly attended by an assigned brother “whose soul is possessed by the fear of God” (53:9, 21). St. Benedict speaks also of the necessary work of administration, of kitchen service, of laundry, of the instruction of novices, and of children. He makes sure that light but still useful work is found for the elderly. As for the crafts: “let the artisans practise their craft with all humility, if the Abbot allows it. But if one of them becomes puffed up because of his skill, and feels he is conferring some great benefit on the monastery, let him be removed from his craft and not allowed to resume it, unless perhaps the Abbot commands him to do so, once he has manifested due humility” (57:1‒3). G.K. Chesterton famously observed that if a thing is worth doing, then it’s worth doing badly. That’s a very comforting truth, ever applicable in a monastery, which will never be staffed by trained professionals, but only by a strange collection of disparate characters who all happen to have received this vocation from God. A monastery must always therefore be a frustrating environment for a perfectionist. Any task or project undertaken will inevitably be interrupted, and its satisfactory accomplishment must be set considerably below the need to follow the daily timetable. That, as we have seen, subordinates work to prayer, and to the general demands of monastic life. The projects of perfectionists also tend to fall foul of the multifarious tasks a monastery always generates. Benedictine monks remain in principle always ready to “abandon whatever they have in hand” in order to follow the call of obedience (5:8). And the obedience matters far more than any particular work, however good, noble or useful. That said, it is wholly in accordance with the mind of St. Benedict that monks should do their work as well as they can: “that in all things God may be glorified” (57:9). So it is that, historically, monks have striven for and achieved outstanding excellence: not only in liturgy; not only in personal holiness of life, but also in art and architecture, in music, in scholarship, in agriculture, in theology, in science, in education and in the pastoral mission. Thank God! “Idleness is the enemy of the soul” said St. Benedict. But so, too, is overwork. And so is workaholism. Nowadays there is a lot of that about. Even while many today cannot find meaningful work because of unemployment, others find themselves driven to do nothing but work, work, work. This paradoxical feature of modern life cannot be entirely excluded even from monasteries. Especially in communities with falling numbers, and rising average ages, a few capable monks or nuns will often find themselves having perforce to accomplish tasks that would previously have been shared, or delegated. Often, too, nowadays, monasteries find it rather hard to identify work that can be both economically profitable and compatible with monastic life. Sometimes large projects established by former generations began as healthy outlets for monastic energy, and steady sources of income for the community. But globalised economics, advancing technology, and diminished human resources can conspire to turn such projects gradually into liabilities. So often we find them now kept going by lay employees, perhaps at a loss, and even losing entirely their properly monastic character. Founders of later orders had in view some special work to which they wished their disciples to devote themselves. St. Benedict’s purpose was only to provide a Rule by which anyone might follow the Gospel Counsels, and live, and work, and pray. The temporal work of our Monastery is of any and every kind, as adapted to the needs of the place and the qualifications of the workers. Even for its own sake, our manual work is necessary to us as an act of penance, and to keep the community in health. But apart from this, it is the lot of poor men to work for their daily bread, and if those who live in the world, wanting money and food, have to work, how much more important is it for those who have chosen to live in voluntary poverty to be forced to fulfil their obligations! The human body is a machine made for work, and for hard work: a repose free from strenuous endeavours must cause flabbiness of mind and of muscle. As our numbers increase, and powers of usefulness develop, we shall hope to extend our labours according to our gifts, working for our daily bread with interest and thankfulness doing our best to deserve that great gift of God, a healthy mind in a healthy body. Dom Benedict Hardy OSB is the Prior of Pluscarden Abbey in Scotland. The Sayings of the Desert Fathers (Apophthegmata Patrum)—The Alphabetical Collection (trans. Benedicta Ward SLG [London: Mowbrays, 1975]). John Cassian, The Monastic Institutes 10:23. Dom Jean-Charles Nault, OSB has recently identified acedia as a principal, if forgotten, vice of our modern times. See his book The Noonday Devil: Acedia, the Unnamed Evil of our Times (Ignatius Press, 2015). “Our Purpose and Method” by Abbot Alered Carlyle OSB, 1874‒1955, first published in 1907, while the community was still Anglican; later republished after its reception into full communion with the Catholic Church; republished again by Pluscarden Abbey, Elgin, Moray, 1987. Keep Reading! The next article in the issue is, A Baker and His Wife Tell of Work and Home by Randy and Lucy Hines.